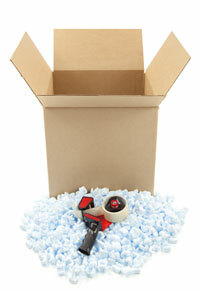 Bulldog Movers doesn’t believe you should overpay for any part of your move –even right down to your moving supplies. That’s why our Atlanta movers have been providing customers with affordable moving supplies for more than 25 years. Many packing supplies, including floor and wall protectors, shrink wrap, blankets, tape, and more, come included when you schedule your move with Bulldog. We also have boxes you can pre-order if you want a head start on packing your Marietta, Roswell, Kennesaw, Peachtree City, or Duluth home or business before your move. And unlike other companies that make you guess the amount of boxes you’ll need and charge for them all, Bulldog lets you pay just for the boxes you use. Whether customers need bubble wrap for priceless heirlooms, corrugated carton wrapping for Persian rugs, or need to secure sofas with shrinkwrap, Atlanta turns to Bulldog for prices they can afford and unparalleled service they can trust. We also offer custom-built wooden crates for expensive valuables in need of extra protection. Consider Bulldog for more than just packing supplies when you need help moving; our standard trucks are larger than the competition, our movers are never subcontracted, and we have earned the Consumer’s Choice Award for nine years in a row. Call or email Bulldog and see why we have the affordable moving supplies Atlanta customers seek for every move.